Emily Dickinson was both a poet and a prolific letter-writer. The 1986 edition of Thomas H. Johnson and Theodora Ward's The Letters of Emily Dickinson publishes 1,049 letters written by the poet, with the acknowledgment that many others are certainly missing or destroyed. 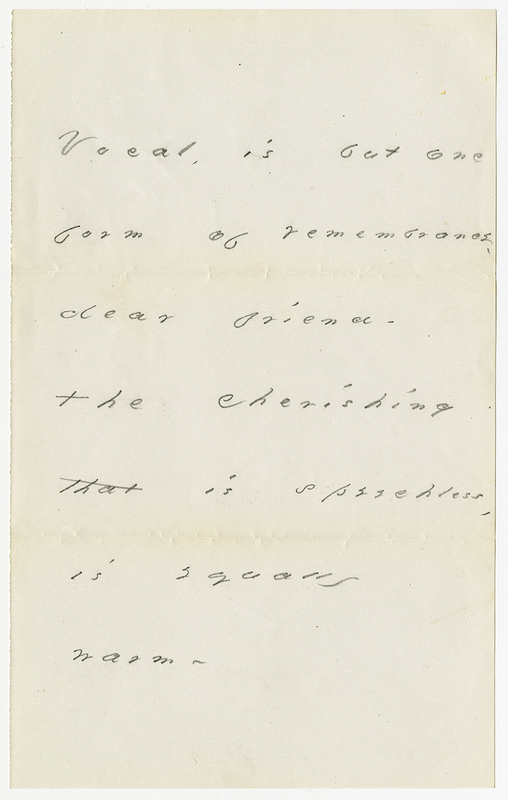 The letter shown here was written by Emily Dickinson (1830-1886) to her neighbor Mrs. Henry Hills (Adelaide Spencer Hills). Mary Adelaide Spencer Hills was born in 1840 in South Manchester, Connecticut. Adelaide as she was known, married Henry Francis Hills, a businesman of Amherst, Massachusetts in 1863. As a wedding gift, Hills built her a house on 360 Main Street (now renumbered as 38 Gray Street) in Amherst, making the couple neighbors with the Dickinsons. The Hills, who lived in New York and summered in Amherst, were friendly with the Dickinsons, and Adelaide was a frequent correspondent with Emily. Dickinson's letter, which is unsigned and undated, was first published in 1894 in The Letters of Emily Dickinson edited by Mabel Loomis Todd (p.400). Thomas H. Johnson who numbered each of Dickinson's known letters, published this as number 614, with a possible date of 1879. After the death of Adelaide Hills in 1910, the letter passed into the hands of her children, specifically her daughter Susan Clapp Hills Skillings. According to Dickinson scholar, Thomas Johnson, a transcript of the text of this letter, and others in Mrs. Skillings possession, was made by George Frisbie Whicher (1986, p.497). Because the letter itself has not been visible for a very long time, the transcription has heretofore been its only record. The punctuation has varied slightly in these transcriptions. Vocal is but one form of remembrance, dear friend -- the cherishing that is speechless is equally warm. Emily Dickinson's letter is held in Special Collections and Archives in James Branch Cabell Library. Permission to view the original must be granted by the head of Special Collections and Archives. For additional information, please see the finding aid.